Sight Unseen explores how racial identity guides the interpretation of the visual world. 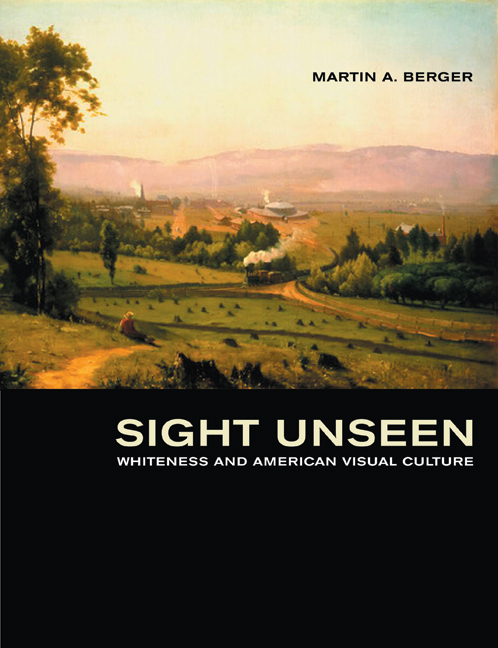 Through a nimble analysis of late nineteenth- and early twentieth-century paintings, photographs, museums, and early motion pictures, Martin A. Berger illustrates how a shared investment in whiteness invisibly guides what Americans of European descent see, what they accept as true, and, ultimately, what legal, social, and economic policies they enact. Carefully reconstructing the racial and philosophical contexts of selected artworks that contain no narrative links to race, the author exposes the effects of racial thinking on our interpretation of the visual world. Bucolic genre paintings of white farmers, pristine landscape photographs of the western frontier, monumental civic architecture, and early action films provide case studies for investigating how European-American sight became inextricably bound to the racial values of American society. Berger shows how artworks are more significant for confirming internalized beliefs on race, than they are for selling us on racial values we do not yet own. A significant contribution to the growing field of whiteness studies, this accessible, provocative, and compelling book exposes how something as apparently natural as sight is conditioned by the racial values of society.